Since her brother's absence, Princess Claudia has seized the throne and brought the Empire to the brink of war with the Il Ronn. Only the missing Prince Alexander can stop Claudia's plans--and Sam McCade has only three months to find him. 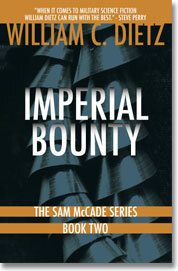 But Princess Claudia controls the Imperial Fleet and will stop at nothing to keep McCade from bringing in his imperial bounty?